Q: How do I find information about scholarships? Visit the Arkansas Department of Higher Education website or call 501-371-2000. Q: How old do I have to be to play lottery games? Look for the "Play Here" sign at retailer locations or visit our retailer locator. Q: Can I use a credit card to purchase lottery tickets? Besides cash, retailers may also accept debit cards and other non-cash, non-deferred forms of payment such as Apple Pay and Google Wallet apps. Purchase of lottery products with credit cards or checks is prohibited. Q: Can I buy lottery tickets through the mail? Lottery tickets can only be purchased from licensed lottery retailers. Q: I live out of state. Can I still play the Arkansas Scholarship Lottery? Sure, if you’re visiting Arkansas. Q: I won a prize. What do I do? Sign the ticket in the space provided on the ticket back. Tickets are bearer instruments, meaning if you lose a ticket before you sign it, you no longer have valid ownership of the ticket. Claim instructions and the claim center location can be found here. Q: What are all the number codes on my lottery tickets? The 12-digit number under the scratch-off covering on instant tickets is used for validation purposes by retailers and entry into the Play It Again® and Points for Prizes® programs. The Points for Prizes® code on terminal-generated tickets is not used to determine if you win a prize. Q: What are "online" games? Can I buy tickets over the internet? Lottery tickets can only be purchased from licensed lottery retailers. Online games refer to terminal-generated games like Powerball®, Mega Millions®, Cash 3, Cash 4, Lucky for Life® and Natural State Jackpot. These games are dispensed by computer equipment connected to a central lottery system. The player picks a set of numbers, the selection is recorded in the system, and the player receives a ticket with a unique validation number. A drawing determines winning numbers. Fast Play games are terminal-generated instant play/win games. Q: What is a playslip and how do I fill it out? A playslip is used to play an online (terminal-generated) game like Powerball®, Mega Millions®, Cash 3, Cash 4, Natural State Jackpot or Lucky for Life®. Players mark desired numbers on a playslip by shading a box that represents each number choice. Retailers insert the playslip into the terminal, which automatically reads the numbers and generates a ticket. Players can also verbally state numbers to a retailer, who manually enters the numbers without the use of a playslip. Players can choose to have the numbers randomly selected by the lottery terminal ("Quick Pick") by either marking the option on a playslip or by asking the retailer. Q: What are the odds of winning a prize? Odds of winning vary by game. Instant game odds are printed on the back of every ticket. Odds for online (terminal-generated) games can be found on the playslip for the game or at the game's webpage by clicking "GAMES" above. Q: How are the drawings conducted? 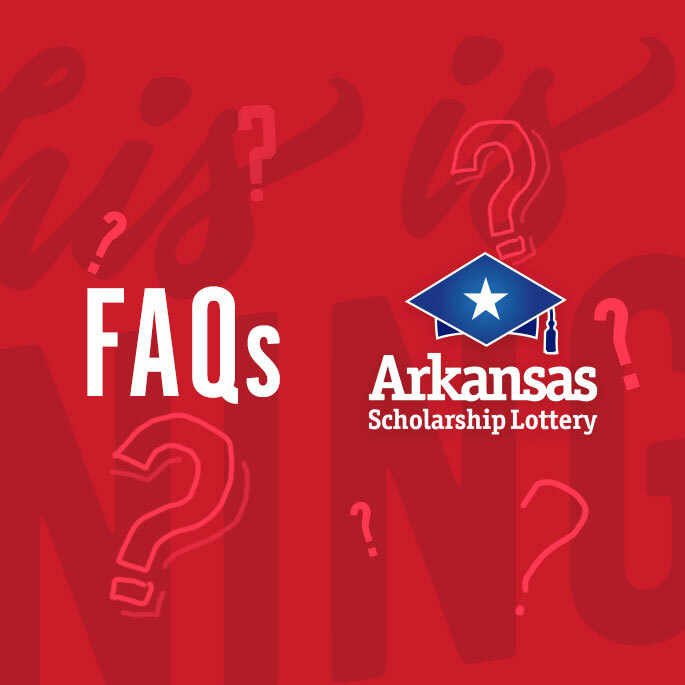 Arkansas Scholarship Lottery (ASL) Cash 3, Cash 4, and Natural State Jackpot drawings use a Random Number Generator (RNG). Draws will be conducted by ASL security personnel and certified by an auditor. Players will be able to receive the winning numbers after each drawing from the ASL website, any ASL retailer, or by calling (501)682-4966. Drawings for the multi-state Powerball® game take place at 9:59 p.m. CT every Wednesday and Saturday in Florida. Five (5) white balls are drawn out of a drum with 69 balls and one (1) red ball is drawn out of a drum with 26 balls. Drawings for the multi-state Mega Millions® game take place at 10 p.m. CT every Tuesday and Friday in Georgia. Five (5) white balls are drawn out of a drum with 75 balls and one (1) gold ball is drawn out of a drum with 15 balls. Drawings for the multi-state Lucky for Life® game take place 9:38 p.m. CT every Monday and Thursday in Connecticut. Five (5) numbered balls are drawn out of a drum with 48 balls and one (1) Lucky Ball is drawn out of a drum with eighteen (18) balls. Q: How long do I have to collect a lottery prize? For an online (terminal-generated) game like Powerball®, Mega Millions®, Cash 3, Cash 4, Natural State Jackpot or Lucky for Life®, players have 180 days from the draw date to claim a prize. For instant games, players have 90 days from the announced last day to purchase tickets for the game to claim a prize. For Fast Play games, players have 180 days from the date of purchase to claim a prize. Q: What happens if I lose a winning ticket? The ASL is not responsible for lost or stolen tickets. A lost ticket cannot be replaced. To protect yourself against theft, sign the back of your ticket. If you are not cashing the ticket immediately, fill out the entire back of the ticket, which may increase your chances of having a lost ticket returned to you. Q: If a winner dies before collecting an entire lottery prize, what happens to the remaining prize money? A lottery prize (or any portion of a lottery prize) remaining unpaid at the death of a winner will be paid to the estate of the deceased prizewinner or to a trust established by the deceased prizewinner. See details in the Arkansas Scholarship Lottery Act. Q: I received a letter from an international lottery saying I won a prize. I didn’t buy a ticket. Is this legitimate? The Federal Trade Commission (FTC), the nation’s consumer protection agency, says most promotions for foreign lotteries are likely to be phony. According to the FTC, playing a foreign lottery through the mail or over the telephone is a violation of federal law. Q: How do I become a lottery retailer? Contact ASL Sales at 501-683-1884 or ASL Retailer Licensing at 501-978-3950.